In this episode, Emily & Professor Alan talk for slightly over 3 hours about the classic graphic novel Watchmen, by Alan Moore & Dave Gibbons. Does it live up to the hype? What do they think of the 9-panel grid? What do they think of the ending? What do they think of Alan Moore and his attitude? Are there any heroes at all in the story? Does Emily REALLY understand the pirate story as well as she thinks she does? Listen to this super-sized episode ... and find out! Thanks to Andrew Leyland of Hey Kids! Comics, Listen to the Prophets, and The Fantasticast, for portraying the voice of Alan Moore. 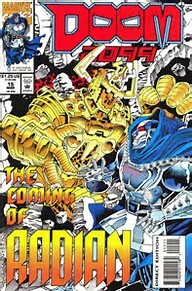 DOOM 2099 #14 & #15, Marvel Comics, cover-dated February and March 1994. "The Anvil or the Hammer" and "Heaven's Net," by John Francis Moore, with art by Pat Broderick & John Nyberg. How does DOOM react when he finds himself in the middle of a 2099 crossover? Does he play well with others? And how does he feel about the concept of "finders, keepers?" And what happened to all the aliens that used to hang out in the Marvel Universe back in the 1990s? Listen to the episode and find out! ﻿﻿﻿﻿Next Episode: The Summer-long event that is Episode 100 ... BEGINS! So what comics did Professor Alan read during April? How many were Rebirth books? How many were for the upcoming epic epic epic Quarter-Bin #100? How many featured the (original) World's Greatest Detective? How many were based on the works of one of the greatest literary minds in history? Listen to this exciting episode #23... and find out!